RankTrackr agency features provide an ability to add users to your account: this way you can enable access for your clients or coworkers. By default, we provide agency features on Pro and Custom accounts. After you complete the last step, the user will receive an email invitation to register for access to your account. While admin has all the permissions to manage your account, users with limited access can only the access the groups that you enable for them. In order to limit user's access to a subset of URLs and keywords, you may want to create the groups and assign them the URLs associated with a specific user. 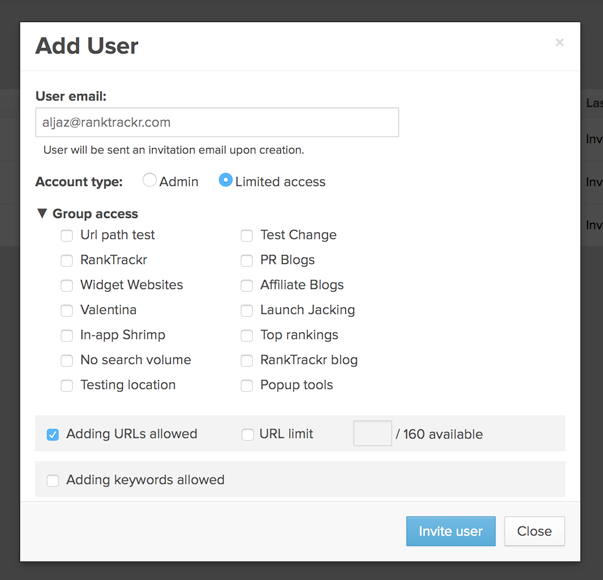 You can limit the number of URLs and keywords that a user is able to add as well.